Yesterday, I set out to make the best chicken pot pie I'd ever made. I succeeded. Both my sister and brother-in-law said it was the best chicken pot pie they'd ever had. Score! The secret ingredient is the thyme! It makes such a difference, trust me. In the past I had used puff pastry for the crust (too soggy), various proportions of roux to broth (too thin), and various other fillings (including diced red potatoes, which next time I may try again). In my focused state to prepare these yummy little pies, I completely neglected to add the frozen peas I had planned on using. They were not even missed! The filling was so delicious that I can easy suggest the peas as an optional add-in next time, but not a necessity by any means. The crust takes no time to make and is totally worth it instead of using pre-packaged puff pastry which may look pretty, but gets soggy the second you dig into your pie. You can easily use leftover roasted chicken for the filling, but I found my way to be fast and easy, and the chicken was still very moist when I mixed it all together. I look forward to making turkey pot pies with the same recipe, but using post-Thanksgiving leftover turkey meat and broth. I'm sure it will be just as good! Bring a pot of water to a boil and blanch the sliced carrots until almost tender. Remove with a slotted spoon and set aside to cool. In the same pot of water, add the chicken strips and simmer until cooked through. Remove and let cool slightly. Chop or shred the chicken into bite-sized pieces. Set aside with the blanched carrots. In another pot, melt the butter over medium-high heat. Add the onions and celery and cook until softened, but not browned. Add the flour to the vegetables and stir until nice and smooth. 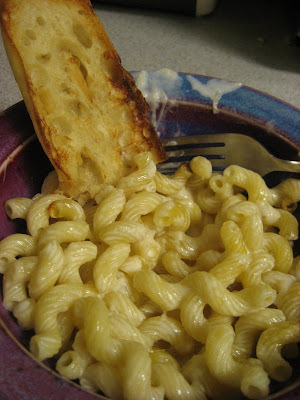 Cook for a few minutes longer so the flour starts to cook, but doesn't brown. Slowly add the hot chicken broth, mixing constantly as to not create lumps in the sauce. Once the chicken broth is incorporated, add the splash of cream and season the mixture with salt, pepper, and dried thyme. Cook the sauce for a few minutes and then add the chicken and carrots and continue to simmer for about 10 more minutes. 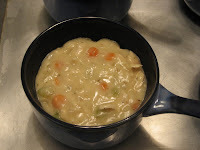 Fill 4 oven-proof soup bowls equally with the chicken pot pie filling. 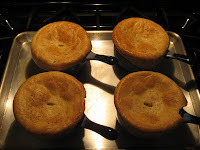 Preheat the oven to 400 degrees F. Remove the pie dough disk from the refrigerator and cut it into 4 equal pieces. Using a rolling pin and a floured cutting board, roll each piece into a circle slightly larger than the circumference of the bowls. 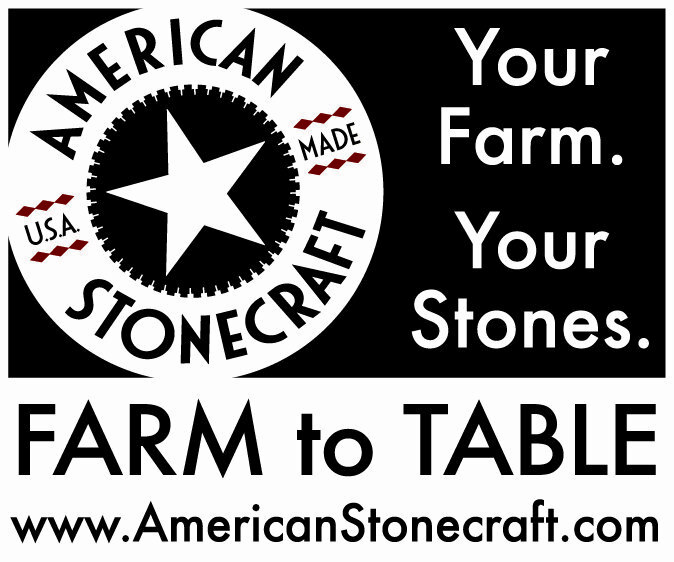 Firmly press each dough circle over the bowls, and cut a small slit in the center. Brush the dough with egg wash and then crack some fresh pepper over the top of each. Put the bowls on a cookie sheet and then into the oven. Bake for 40 minutes or until the crusts are nice and golden brown. Let cool slightly before serving, as the filling will be extremely hot. *Update* Although I love this chicken pot pie recipe, my updated version for Chicken Pot Pies Primavera is my current favorite! 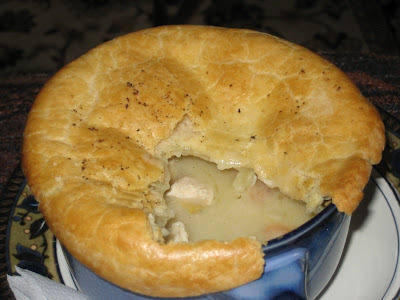 Please check it out if you are looking for a great pot pie recipe :-D Thanks!